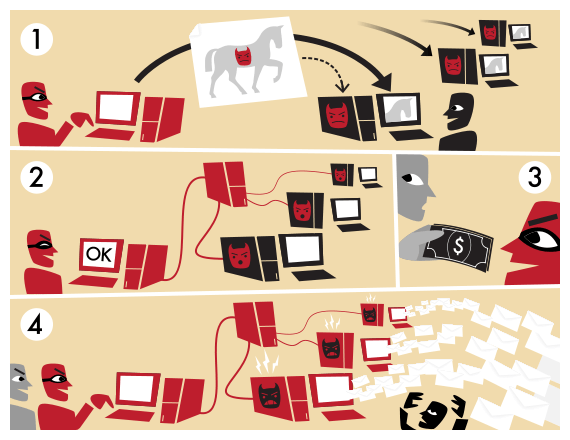 An infographic of how a Botnet works…I’d like to see an infographic of my ANTI-BOTNET. Anyone? Tasked with creating a ‘persona poem’ yesterday (with the suggestion of a superhero). So I started trolling the internet for some inspiration – and came across this story from today, which I found simultaneously interesting, amusing and alarming. WordPress (which hosts this very site) has been ‘attacked’ by a ‘Giant Botnet’ of some thousands of linked computers since last week – and this may have been a pre-cursor to a much larger attack (a ‘Mega Botnet’? )…When thinking, then, about a superhero – I thought we (WordPress users, many of whom will be using it to share their NaPoWriMo efforts) could do with the ANTI-BOTNET. Last month, I went to the Leeds Trinity Writers’ Festival Day and we did a workshop on the ‘Techno-Poem’. This seemed such a rich thread of techno-speak, -images and -ideas, I thought… HERE COMES THE ANTI-BOTNET (WHO ALWAYS SPEAKS IN CAPITALS). THE SPAMDEX-NETQUAKE OF MY ROAR.